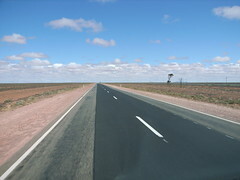 For anyone that has been on a big outback trip these pictures will feel very familiar. 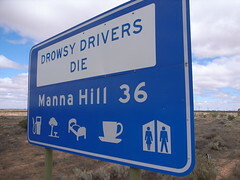 I always have fun reading the signs targeting sleepy drivers. 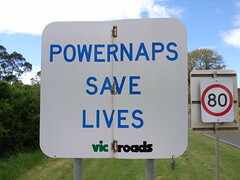 I’m sure it gets confusing for some people when to ‘powernap’ and when to ‘micro-sleep’... Drowsy Drivers Die, reminds me of a piece of graffiti I read on a train once which read “if you read this you will die!” which I really wanted to add “...at some point”. I thought it was very zen even without my addition. Bianca and I thought that “Powernaps save lives” would make a great office poster. I suggest that you have a powernap today...you never know who you might save but please don’t powernap while you are driving.